Summer is upon us! The time to spend leisurely evenings watching the sunset while you BBQ and hang out with friends. If you’re looking for some good recipes to try, this post is for you. Here are a bunch of my favorites that have been well loved at potlucks and parties I’ve gone to. Broccoli Salad – This is an easy recipe and a good one to make for a potluck. Who doesn’t like bacon in their salad?! Cheesy Kale Chips – I started making these a few summers ago and they were a humongous hit. So much so that people request them when they come over. I made a bunch for a 4th of July party a few years ago and my neighbor brings it up every summer– am I going to make more?? Creamy Dill Cucumber Salad – I’ve been craving this salad for awhile now. It’s cool and refreshing and goes well with a lot of BBQ food. Japanese Sesame Cucumber Salad – A variation on the cucumber salad. Low in calories and delicious! Jalapeno Poppers – Michael makes some GREAT ones! By the end of summer we have so many jalapenos in our garden that we start making poppers to use them up. These are so addicting! 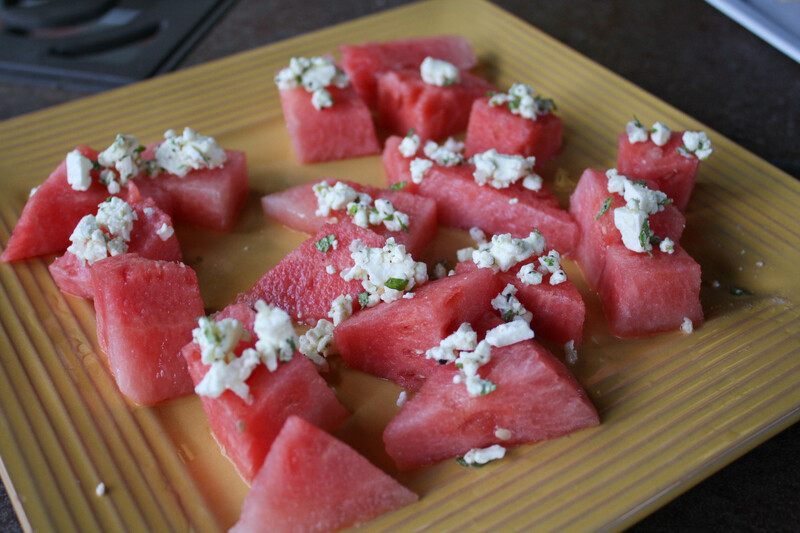 Watermelon and Feta – This might sound weird, but it was such a refreshing, tasty summer snack! The shallots, fresh mint, feta and watermelon went together so well. Give it a try. 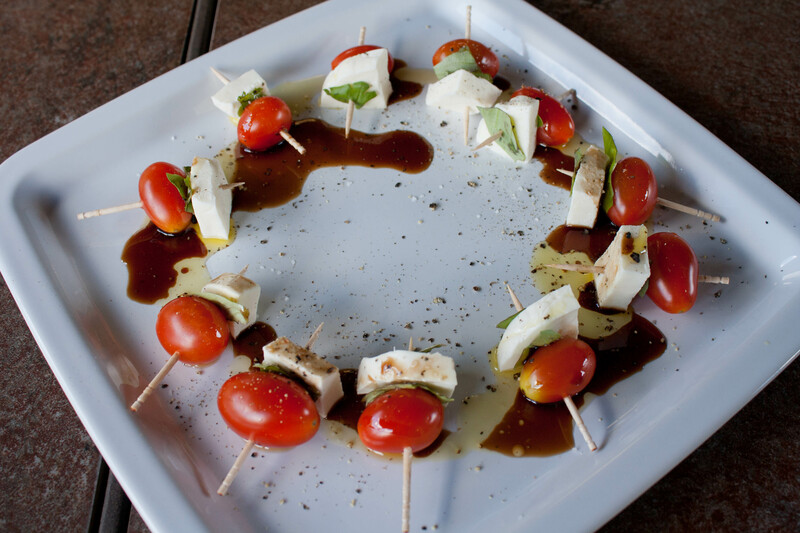 Caprese – This is an easy salad or snack to make and it’s always a hit when I serve it at parties or BBQ’s. It’s easy and if you have an abundant tomato garden like we do, you need creative ways to use them up. Don’t those look good? They are great for summer time when you don’t want to cook anything, too. 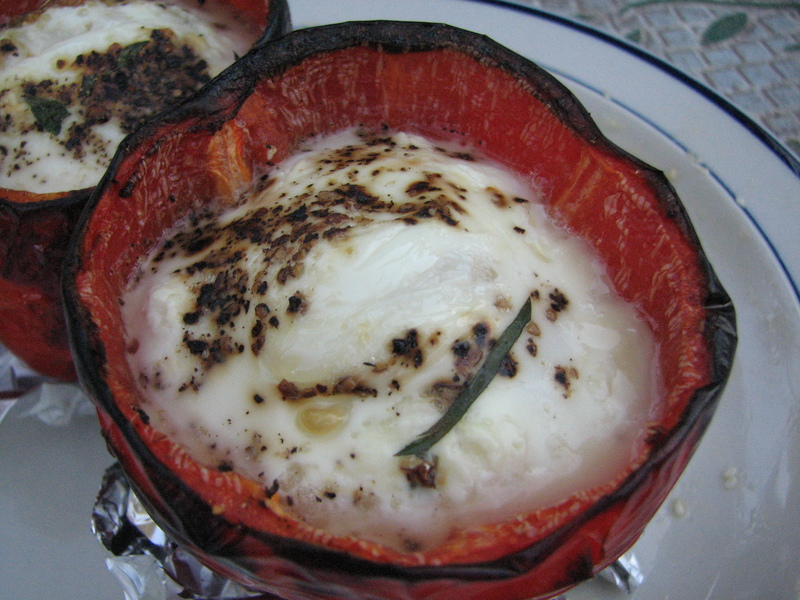 Grilled Peppers and Egg – This recipe was a fun one. It was unique and delicious and so easy to make. Just put a raw egg in a pepper with some seasoning and grill it up. It’s a great one for those long summer days. Chickpea Salad Wrap – This is a vegan recipe that was actually so tasty you don’t notice it’s vegan. It could be a entree as a wrap or you can make it into a side dish and eat it like a salad. Pasta with Broccolini, Pickled Goat Horn Peppers and Goat Cheese – One of my favorite pasta dishes! The spicy peppers and the goat cheese…it is all amazing together. I love this recipe so much. In fact, I need to make it again soon! Do you have a favorite summer recipe you’d like to share?